Although the Model E was introduced by Innocenti in April 1953 none of the 42,352 scooters that were produced were ever sold in Britain. The Model E was intended as an entry level scooter and was therefore much simpler in design than either the Model C or Model D. The frame tube was C shaped underneath the riders seat, built into the top part of this C shaped frame was a tool box, while the fuel tank was under the front seat and a butty box behind the passenger seat. Due to a simplification in the frame construction the frame was now lighter than that used on previous models. A large round headlight was fitted at the front of the scooter with a smaller round light fitted at the rear just above the number plate. Shortened leg shields (like those on the Model D) were also fitted. To start the scooter a pull cord (like that found on chain saws) was mounted in front of the magneto, the ignition on the E could be advanced and retarded for ease of staring on the pull cord, this ensured the machine did not 'kick back' injuring the person while starting it. 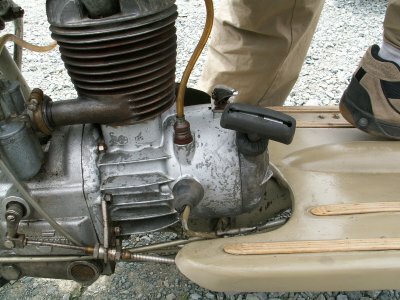 Rear suspension on the Model E was the same torsion bar set up as found on the Model D. However, at the front of the scooter the suspension was elastic as opposed to the trailing link found on the Model D. The trailing link design saw the forks were fold back upon themselves, and used C shaped springs with rubbers in between that allowed the fork link to open and close the spring. Because of this models poor suspension, many were converted by fitting a special kit, which added a spring between the link and the forks. Another modification, which makes the E very hard to find now, was to the pull start, many were converted to that of the F, a kick start which also included cutting the leg shields as the F kick start pedal was at the front of the engine. The 123cc engine was essentially the same as that found on the Model D (save for the pull starter) and gave the rider a top speed of 44mph. 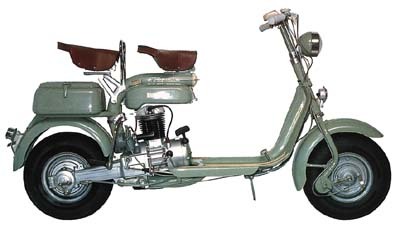 The Model E was available in either grey, green or maroon and production of the scooter ceased in February 1954.